A fun way to explore shapes with your students! After discussing all the shapes and animals in the book with the children, I then invited the children to help me sort a set of felt cut out shapes onto our flannel board graph…. Graphing was the perfect activity for this book. We are loving graphing at my house too. What a fun beginning graphing activity. 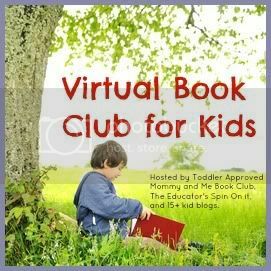 Thanks for sharing, joining and hosting the Virtual Book Club! Can’t wait to go check out your other posts with her books too. I just love her simple colorful illustrations in her books. Hello! I am also going to try this lesson with my first garedrs. Can you tell me what size red construction paper circle you used for the birds? Did the kids make the circle or did you have them cut in a circle already? Today I’m doing the tree dragging with black paint, hopefully it goes well!